Salento used to be part of the ancient area known as Magna Grecia. Evidence of this heritage still remains today: grika – a variation of the Greek language, is still spoken in the region and can be seen on shop signs and calendars. 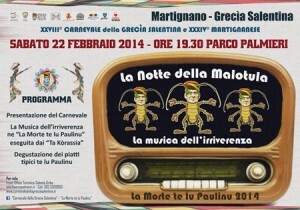 The “Carnevale della Grecia Salentina” is a popular event which has been taking place for the past thirty years. Aimed at conserving the area’s cultural and linguistic heritage, it involves all the towns and villages of the Grika part of Salento. Its many events include a parade with floats, music, dance, songs, plays, storytelling and masked players. The Notte della Malotula features “irreverent music” and the traditional celebration of the grotesque which is a key part of the opening and closing of the carnevale. There’s also a chance to taste some typical grika dishes.